Processes The shrink sleeve applicator is a compact and efficient machine that is easily integrated into the existing systems to attain a complete wrapping effect starting from draping to sealing and labeling including all the necessary details. The earlier technologies involved having the sleeving and labeling operations being handled as separate processes and there was little effectiveness in the process. These processes were also labor intensive and quality of the package was never guaranteed. With increased product demand and need for efficiency in manufacturing, designconsiderations have significantly changed. The introduction of the shrink sleeve label applicator machine has helped to achieve this much needed efficiency in shrink wrapping and labeling. High Productivity The machine models from Bhagwati uses the most advanced shrink technology, equipped with a large touch screen control system and advanced logic control system that gives superior labeling speed and accuracy. The machine can achieve a speed of up to 100 products per minute of operation. Use Simplicity There are provisions such as being easily movableand adjustable height, which makes it easy to fit the machine in line with existing production equipment. The shrink sleeve label applicators also offer advanced job memory and even trouble shooting menus and allows for quick changeover from one product to the next. Customer Support The support team from Bhagwati labeling, not only gets you the best product, but are also always at hand to give you any kind of assistance that you may require. Built to last All equipments from the company are developed in line with all the good manufacturing practices standards (GMP). The machine is developed in a solid and steady frame with durable stainless steel. Interlock doors are also used for protection from the many moving parts which makes for easier operation and maintenance. This design of construction makes the machine long lasting and durable. Out of film detect mechanism and automatic stop that reduces the level of human supervision. High memory capability to store more production recipes and reduce the change over time. 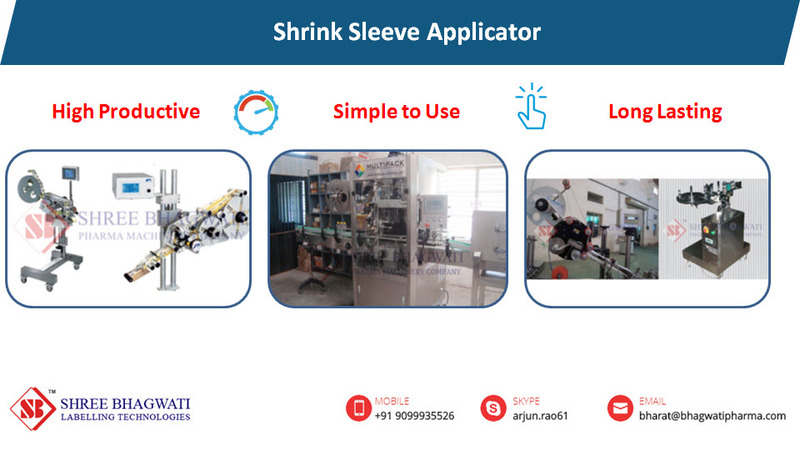 Exceptional shrink sleeve applicator design and control mechanism that enables you meet the changing demands of the market. Accuracy and speed: there is an easy to operate machine panel to enable you to quickly adjust operating speeds and performance optimization. Practicality: the sleeving and induction cap sealing machines from bhagwati labeling company are developed with features and applications that are practical to the needs of the industry. Machine capabilities are developed to meet the modern day business demands while also considering the trends for tomorrow. Safety: all equipments are made in consideration to the operator safety standards required. Reliability: the shrink sleeve label applicator equipment and other labeling equipment from the company, are made to last, with high energy efficiency, and lower power consumption. With these, there is a quick return on investment.